Recognizing the history and the significance of a newly formed US Army Patrol Boat Company during America’s longest war could hardly have be seen at it’s founding in March 1968. Even in today’s light, those who served in what became known as the 458th Transportation Company (PBR) are only able to document small detailed accounts of their units history during their tours in Vietnam. An organized effort is currently underway by the men and families of veteran members to tell the story of their beloved units efforts in Viet Nam. The 458th can trace it’s roots back to June 2, 1943, during WWII. At that time, the 458th was a Amphibian Truck Company bound for England, France and Omaha Beach. There the 458th provided direct support using a new 2.5 ton transport machine, aka “DUKW”. Taking supplies directly from the ship to the frontline support units to unload. Later they also participated in the Northern France, Rhineland and other operations, earning the unit an Arrowhead and Croix de Gerre with palm for it actions. In June of 1964 the 458th Transportation Company gave up their “DUKW’s” for the new Lighter Amphibious Re-supply Cargo or (LARC), which carried 5 tons of material, ship to shore. The 458th Transportation “LARC” was assigned to the 10th Bat. 4th Transportation Command and later deployed to Cam Ranh Bay, RVN in Oct-1966. Their mission and areas of operations were expanded in short order to include Nha Trang, Phan Rang, Phan Thiet and Vung Ro Bay. At the helm of the 458th was 1st LT Walter Gruff. At Phan Thiet, the 458th directly supported 2nd Bat./7th Cavalry through Operation Byrd. Problems developed over ship security in the port areas in 1967, then CO, 1st LT RA “Pete” Sellers was given 6 Boston Whalers to conduct harbor patrols with. As the buildup continued in Vietnam, the 458th mission was also beginning to change. 1st Lt. Sellers was asked to attend strategy meetings along with the 18th MP Brigade to devise a plan to augment needed harbor security requirements up and down the coast Vietnam. A plan was approved and put into motion for detachments with 39 newly manufactured MKII PBR’s and the use of Boston Whalers to be used to backfill Naval Units being repositioned. Home Plate originally established at Vung Tau, but was shortly moved to Pershing Field, Siagon. Detachments were established at Cat Lo, Cat Lai, Quin Nhon, Newport, Nha Trang, Vung Ro and Cam Ranh. 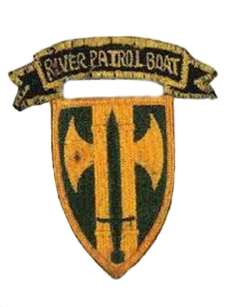 Patrol Boat River, (PBR’s) were the first fast attack fiberglass patrol boats of their kind introduced into a war theater by the US Army. It was also the first and only time the US Army provided for the use of this style of watercraft within the transportation community. Due to the nature / firepower of the boat and required work of a PBR sailor, volunteer Army Mariners underwent special training with the US Navy at Mare Island, California. ALL Army PBR sailors were volunteers. Army PBR’s were identical to the Navy PBR’s, including the never found elusive toilet paper holder rumored on Navy PBR’s ! Each PBR was assigned a Transportation coxswain (Boat Captain) and a marine engineer. The local 18th MP Brigade’s local MP company would assign two MP’s as gunners. Also on board was an assigned Kan Sat or Quan Kaht, (policeman or VN MP) who acted as interpreter. All 458th detachments came under the direct authority of the 18th MP Brigade. Interdiction work is defensive in nature and due to fears by S2 & S3, there was to NEVER be any free lancing, (such as setting up unauthorized ambushes or patrolling outside your given assignments). Those that did were removed in short order. It is believe they harbored unfounded fears about E4’s and 5’s having command of this sort of firepower could be dangerous. On the other hand, we know that it was in the hands of E4’s and E5’s when meeting the enemy head on that the 458th PBR shined. 1 meter under the water, 45 Ft forward of stern. Tied to eyelet located just forward of the rudder, second line from mine is tied to another eyelet 60 Ft. forward, port side. After assessment, it is decided not to wait for EOD, if it blows here the ship will go down at the pier, blocking it’s use. A plan is developed, the forward line will be cut on the way back to the PBR and the skimmer will go around the starboard side and cut the stern line to the mine. Brower cuts the forward line transfers to the PBR and instructs a Lt. JG to get the men off of the port rail. The idea is to slowly drift it away from the hull, then tow it clear of the ship. He mine has already moved away from the ship a foot or so. However, before the skimmer begins its return, two CDT3 divers appear at the stern. Clearance Diver John Kershler enters the water from a small floating dock and agrees he will cut the stern line to the mine and steer it away as we pull him out. Once we know we will be able to clear the ship, Kershler lets it go and the PBR finishes pull out. Kershler and Kingston perform a dive on the entire ship while Brower and Noland stake the mine to a fishing stake. The 50 lb shaped C-4 mine detonated near high tide about 0700, a twelve foot hole opens in the water and spouted to 35-40 ft. At 0830 Brower, Noland and an FNG MP are greeted by the Chief of the LST and thanks given from the CO of the Meeker County. Asked to stay for breakfast however orders from Cat Lo was to return ASAP to replenish and rest up for next patrol. It was quite the shock when the LST-980 mine detonated. The boat crew all realized how close we came to being killed removing it. It also taught Swimmer / Sapper Team 10 something. It taught them that although they may have failed in the attack on the Meeker County, the plan was good and needed another try. The MSL ships, SS Green Bay and American Hawk fell victims to these tactics to Sapper Team 10 in June and August of 1971 at Qui Nhon. On 29 January 1969, while flying his L19 “Bird Dog” on a routine aerial observation flight, CPT Lermon N. Jenk spotted what appeared to be camouflaged sampans and bunkers along the edge of the harbor. Jenk radioed the position of sampans and bunkers to the Army PBR detachment out of Qui Nhon patrolling the waters of Qui Nhon. Ten minutes later three PBRs nosed around through the dangerously shallow waters to investigate the dike area. The Canh Sat (national police) had confirmed that the activity was enemy. The MPs on board the PBRs called for the VC to come out and surrender. Several enemy emerged from the bunker trying to run way. The PBRs opened fire with their .50 caliber machine guns. SP4 James E. Brady’s PBR came under intense enemy return fire. He received a shrapnel wound in his left shoulder but continued to maneuver his boat to advantageous firing positions. CPT Jenk wrote in his report that “the PBR crewmen maneuvered their craft and continually exposed themselves so they could place more effective fire on the enemy.” All three boats fired on enemy positions radioed to them by Jenk flying overhead. Throughout the fight Brady refused medical attention to operate his boat. At one point one of the machineguns jammed and he left the helm to help the gunner fix the weapon. The boats pulled back for several air strikes. Because Brady effectively blocked the escape routes of the sampans, he had sealed the enemy escape routes by water. When they went back in the MPs searched the area and found at least 15 enemy dead, ten enemy bunkers and 20 sampans. Jenk concluded that “The courage and intelligent decisions of these PBR crewmen were in keeping with the highest traditions of the military and reflected on themselves, their unit and the United States Army. SP4 Brady earned the Bronze Star Medal with V device for his actions. Sgt. Bell was awarded Army Accommodation medal with “V” device for valor. Others present were also awarded ARCOM’s. On 3 April 1971, James was a seaman on a 458th PBR, his boat with several other PBRs were taking aviation fuel to combat units operating near the village of Cho Thu Bay when his boat hit a mine, causing it to catch fire and then was caught in enemy crossfire from the surrounding banks. The boat ran out of control and beached. Unable to leave the kill zone of the canal and being gravely wounded, Jim decided to stay with the boat and cover the convoy fighting it’s way out. Having stayed with the boat manning the aft 50, he battled the enemy until the enemy’s guns fell silent. Jim died of his wounds several days later. For his heroic acts of gallantry on April 1971 Jim was awarded the Silver Star and his second Purple Heart . This shows that Army crews and patrol boats were effective when called upon. However the 458th mission continued to stay mostly defensive throughout their existence in Vietnam. The 458th was inactivated in Vietnam on 1 September 1971. As part of the 18th Military Police (MP) Brigade, the 458th received the Meritorious Unit Commendation for the period of 26 September 1967 to 31 October 1968 and the Vietnamese Cross of Gallantry with Palm for 1966 to 1971.